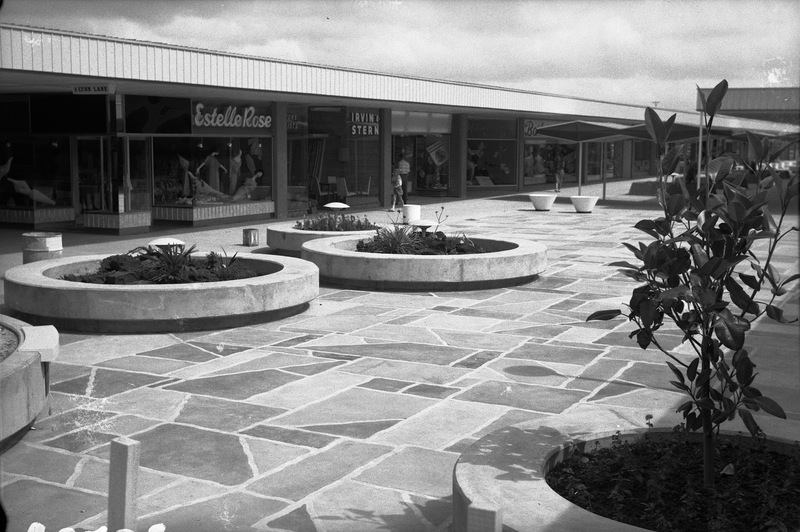 New Zealand’s first American-style shopping centre LynnMall opened on 30 October 1963. A 110 foot tower with a flashing red beacon marked the site which had previously been a swampy, seven-acre scrub-covered paddock. LynnMall offered a relaxed, traffic-free arrangement of shops around a weather-proof courtyard with a fountain, flowers and trees. There was plenty of seating, a free children’s play area and 500 free car parks. Three of the city’s largest retailers anchored the centre - Farmers, Milne & Choyce and Woolworths - and were complemented by 43 specialty shops such as La Gonda Fashion, Kean’s, Starforme Foundations, Masco and Curtaincraft. Ref: J. T. Diamond, LynnMall from Farmers end, November 1963, West Auckland Research Centre, Auckland Libraries, JTD-11A-02070-2. In 1965 the corner-stone was laid for a second Auckland shopping mall developed by the same company – Southmall. Farmers and Woolworths were already signed up and soon joined by a Four Square supermarket. Specialty shops included The House of Flackson, Pacific Bags, Prime Meats and the Havana Coffee Lounge. 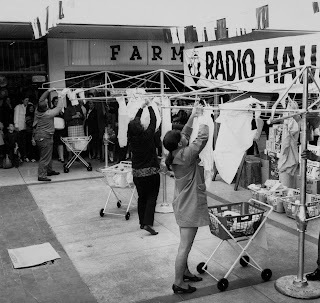 Ref: Market day, Southmall, 7 October 1969, South Auckland Research Centre, Auckland Libraries, Footprints 05388. In an eerie coincidence, just as LynnMall had a 110 foot tower as a symbol, Southmall’s symbol was a landmark 110 foot Norfolk pine tree. 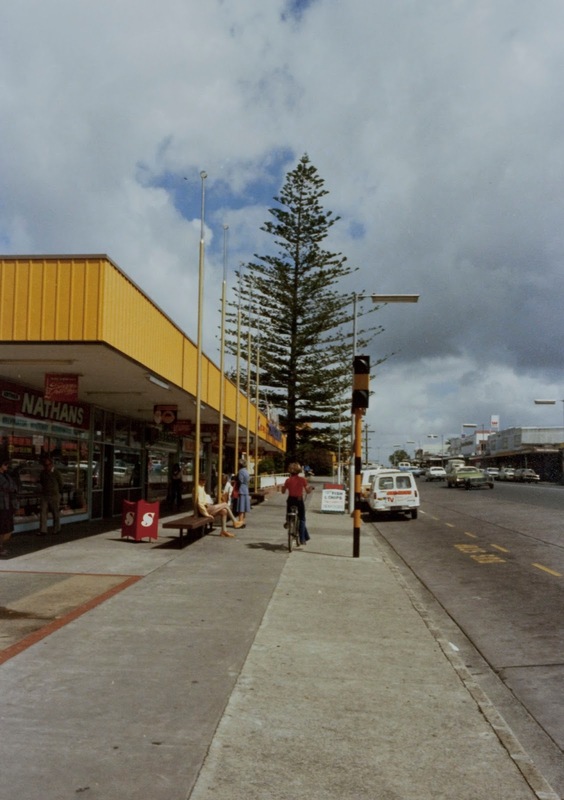 Known as Manurewa’s “Christmas tree” the old pine had been decorated with Christmas lights for many years and plans were made for it to be lit up for the centre’s 1967 opening night (Auckland Star, 18 January 1967). Ref: Southmall, c1979, South Auckland Research Centre, Auckland Libraries, Footprints 00992. Both malls were so popular they soon began expanding. 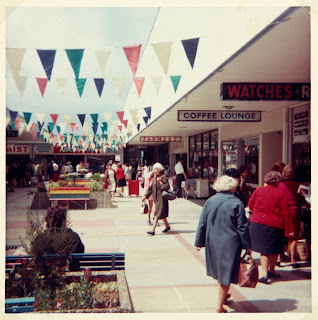 In six years, LynnMall’s original 500 car parks grew to 5000 and the centre added seven new shops plus the Western-themed Supervalue Supermarket which had wagon wheels arranged on the walls above the meat section. The three-day expansion celebrations included performances by Lou Clauson, Brendan Dugan and magician “Mr E.” There was also a mall-wide sale with bargains such as Helanca slacks from Milne & Choyce for $3.99 a pair (reduced from $8.99) and baby stretch ‘n’ grow sleeping suits for $2.85 from The Sunshine Shop (Auckland Star Supplement, 5 May 1970). Entertainment was a year-round feature of mall life with baby, beauty and bed-making competitions, musical performances, quizzes, and appearances by celebrities such as The Chicks and Shane who autographed posters for adoring crowds of teenagers at LynnMall (Western Leader, 19 March 1970, p 13). Ref: Excerpt from the Western Leader, 19 March 1970, p.13. 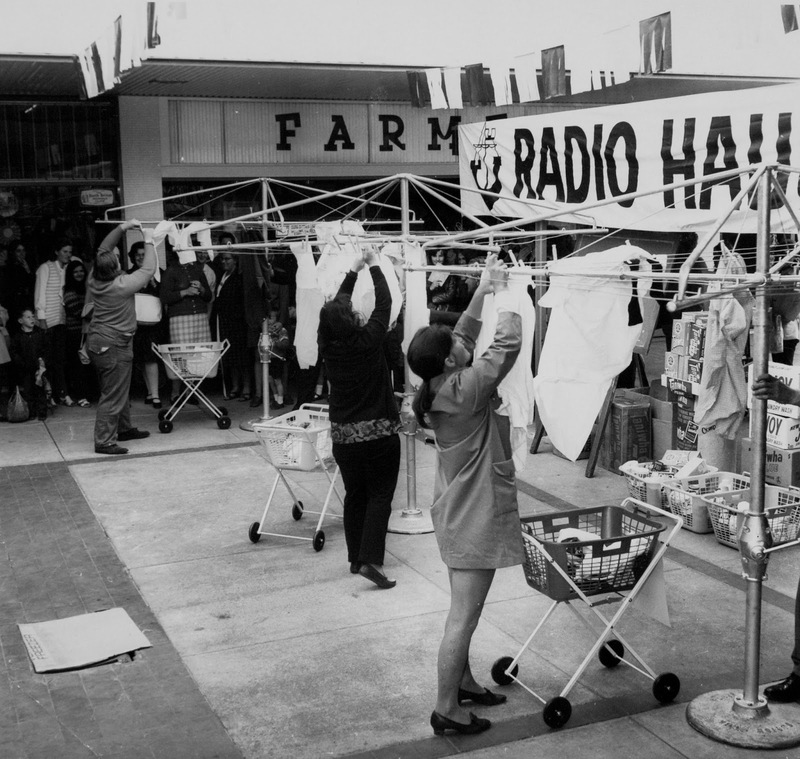 Competitions held at Southmall in 1970 included the peg the clothes contest where women raced against the clock to peg clothes on washing lines. Heats were held twice daily, and Mrs Nancy Arama was the eventual winner after hanging out 11 garments in one and a half minutes (The Gazette, 6 October 1970, p 11). Ref: 'Just for the hang of it', Southmall, September 1972, photograph reproduced by permission of Fairfax Media, South Auckland Research Centre, Auckland Libraries, Footprints 00194. Another crowd-pleaser was the Make-a-Paper-Dress contest where entrants taped together pages of the local suburban paper and, without using a pattern, made a beautiful garment in 30 minutes. First prize was $100 worth of dress length vouchers from Barker and Pollock. The finalists were Mrs Pritchard, Mrs Dickson, Mrs Moon, Mrs Brown and Mrs Caie. 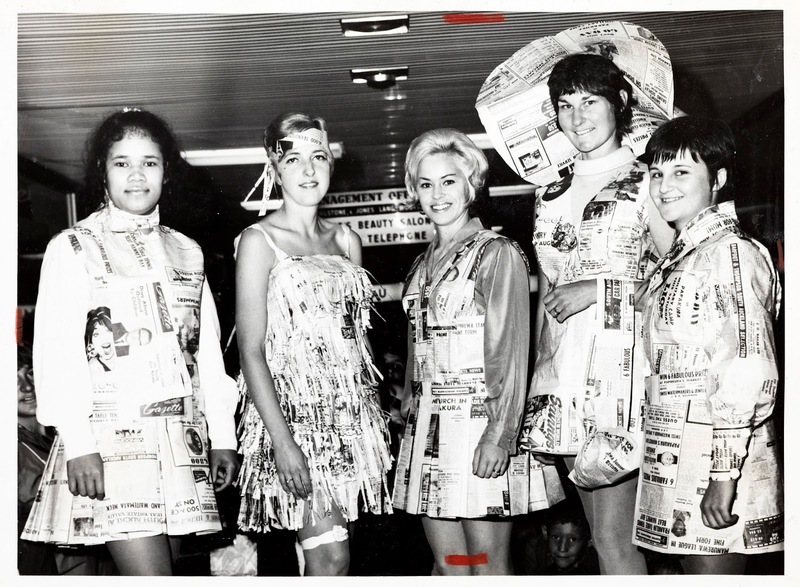 Our picture shows their creations modelled by Mrs Leiataua, Mrs Linkhorn (second prize), Mrs Gribble (first prize), Mrs Smith and Miss Caie (The Gazette, 15 September 1970, p 13). Ref: Paper fashion, Southmall, 11 September 1970, photograph reproduced by permission of Manurewa Historical Society, South Auckland Research Centre, Auckland Libraries, Footprints 05397. After that excitement, shoppers could take the whole family to Pizza Hut for a $3.00, 13-inch family pizza. Alternatively, they could ring the new Dial-a-Pizza service and collect their order from the store – as home delivery was not yet on the horizon. Fond memories of visiting Southmall and the Manurewa Cine Centre to watch Tarzan movies in the school holidays. 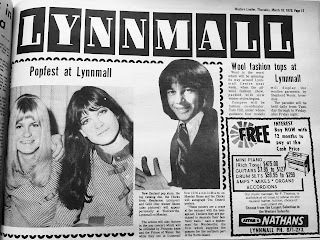 I remember entering a competition to design a sign for Lynnmall. I came 2nd in the junior category and won a camera and hamper of goodies presented by Phil Shone I think. I have a clear memory of walking around the edge of those circular gardens in lynmall as a small child, I think it was what I looked forward to the most, the tower I remember, and the smell of the coffee shop and the glass percolators. 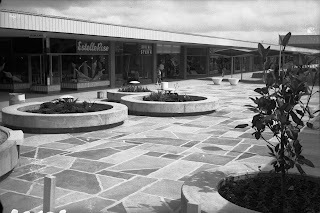 The walk across the square from the car parks, and the opening of the pizza hut, trips to farmers with my mum. Amazing how much comes back from just a few images. I have a memory of being put in a cage lol. Does anyone have a photo of the children's play area ? Was it like a cage?